Houston, TX - December 12, 2017 - AcctTwo, a leading consulting firm and provider of cloud-based financial management solutions and managed accounting services, announced that the firm has been ranked the 11th fastest growing private company in Houston, according to the Houston Business Journal's Fast 100. This list is comprised of companies across multiple industries who have shown outstanding revenue growth between 2014 and 2016. 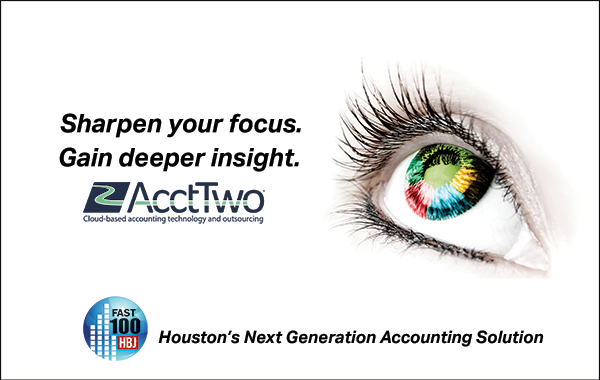 We're excited to announce that AcctTwo is sponsoring the Houston Business Journal's inaugural Houston BizExpo and Fast 100 Awards ceremony Friday, 9/9/2016. 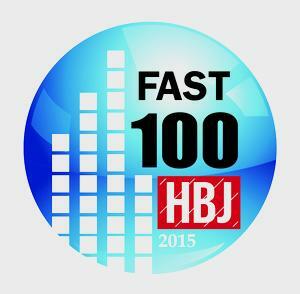 Houston, TX - August 18th, 2015 - AcctTwo, a leading consulting firm and provider of cloud-based financial management solutions, announced today that it has been named to the Houston Business Journal's Fast 100 list of the fastest-growing companies headquartered in the Houston area. This list is comprised of companies across multiple industries who have shown outstanding revenue growth from 2012 to 2014.